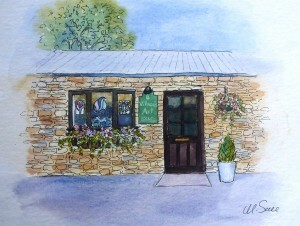 Welcome to Vitreus Art – a friendly art gallery and art workshop at Wakefield Country Courtyard. Vitreus Art @ Wakefield brings you a frequently changing range of affordable art by local artists and craftspeople, including functional and decorative ceramics, art photography, small sculptures, fused glass, original paintings, hand-crafted jewellery and printwork that you won’t find on the high street. 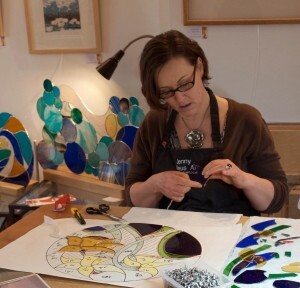 As well as a gallery, this creative space is home to stained glass artists Jenny Timms and Mike Caddy, with a selection of their contemporary glass art work on show. 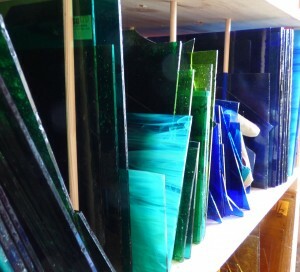 Mike and Jenny work in both traditional and modern stained glass techniques and often incorporate etching and lighting in their work too. As this is a working studio visitors may well see stained glass commissions or windows being created, and are welcome to ask questions or watch Jenny and Mike at work! And if you’re inspired to get creative, have a look at the art and craft courses on offer. Taught by established artists, the growing range of courses includes unusual artforms such as Encaustic Wax Art and textile sculpture, traditional painting and drawing classes for all levels and mixed media for the adventurous. For lovers of glass art, Vitreus Art offers stained glass classes for beginners (and beyond), glass fusing with a kiln and glass appliqué (a little like mosaic). If you’re searching for a distinctive gift, a voucher for an art course or to be spent at the gallery is sure to bring pleasure, whatever the occasion being celebrated. You can even treat yourself!